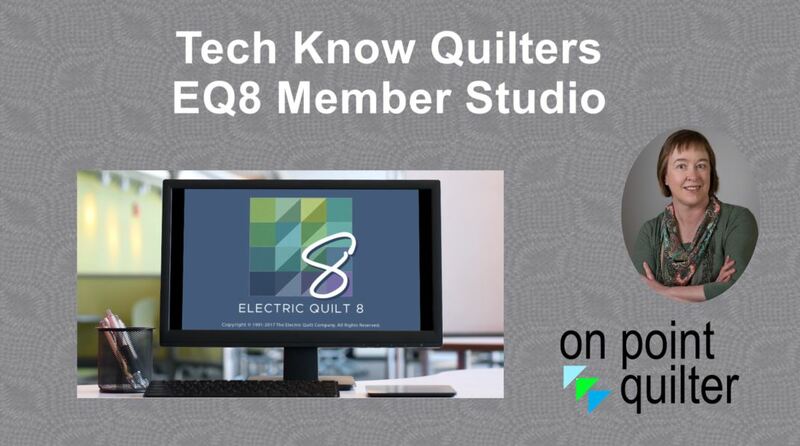 Click on the webinar image to sign up to learn about the latest updates to EQ8 and the Tech Know Quilters membership studio. With registration closed, we will now shift our focus to our community and teaching. If you would like to be notified the next time Tech Know Quilters membership opens, click below! Is Tech Know Quilters Right for You? Would you like to become proficient in Electric Quilt 8? Have you been frustrated with your skills in drafting blocks and creating stunning quilts using Electric Quilt? Or do you go to use the software and realize you are missing that one vital piece of information. Or maybe you have just struggled finding the time to get started. Do you have 10 minutes 3 days a week to invest in your Electric Quilt education? One of the challenges many Electric Quilt users experience is finding time to practice what they have learned in a class – or even finding the time to take a class. Without practice, the skills can atrophy. This online training program is built to allow you to build your Electric Quilt skills in small increments (think 10 minutes a day). Because each session builds on previous work, it not only provides a new skill, but also reinforces previous learning. Are you ready for an EQ8 membership program? The Electric Quilt 8 Member Studio is designed for all levels of Electric Quilt users who have purchased or upgraded to Electric Quilt 8. 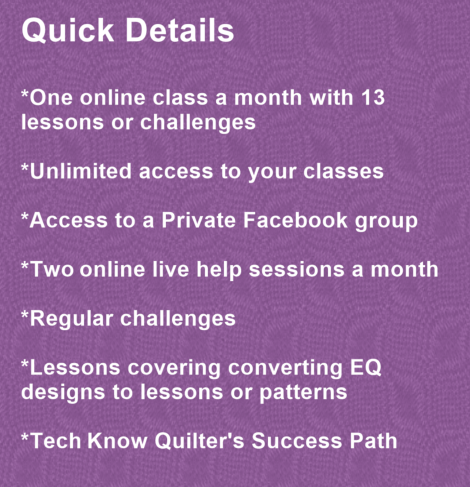 Access to one training class per month covering a significant topic within Electric Quilt 8. Your course will include 13 separate lessons or challenges e-mailed on Monday, Wednesday and Friday of each week. Unlimited access to videos and handouts for purchased classes as long as the Tech Know Quilters program is in existence (even if you decide to cancel). Access to a Private Facebook group only for those enrolled in the ongoing Tech Know Quilters Member Studio program. This will be a chance to ask questions and share photos of your work from the class. A copy of the Tech Know Quilters Success Path so you can track your progress as you expand your Electric Quilt Skill set. Regular challenges including (1) recreating an existing quilt from a picture or pictures of the quilt, (2) designing a quilt or block around a particular theme or style and (3) applying your lessons from the current month to a quilt of your own. Starting with month 7, your lessons will include a lesson on converting Electric Quilt designs to a formal pattern or instructions for a class you plan to teach. Adding fabrics from manufacturer websites to your library -- plus a list of current fabric manufacturer's with their websites. Creating your own Custom Fabric Library. Adding fabrics from Electric Quilt free monthly downloads to your library along with other EQ purchased sources (such as EQ7, Stash, Dear Jane). Finding complementary fabrics in Electric Quilt. Photographing and scanning your own fabrics. Fussy Cut and Rotate Fabric tools. Coloring the Stripe Quilt, plus bonus piecing pattern for the quilt. Shades, Tints, Tones and Grades. These help sessions are designed to provide extra assistance in Electric Quilt. It can be on the topic of the month or a project you are currently working on. You are also welcome if you just want to stop in and say hi. I will provide videos of the help sessions to all current members -- whether or not you enroll or attend the session. You can choose to start the training at the beginning or jump in and join the most current month's training. The Give Me the Latest Class Option is for those that are comfortable jumping in and wish to focus on the latest release from On Point Quilter. If you prefer to start with the January 2018 Working with Fabric Images class, please purchase the Start from the Beginning Option. 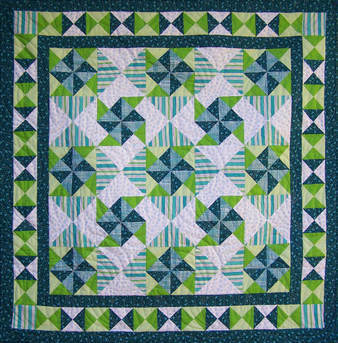 Each month will have a new training theme that covers a significant concept in Electric Quilt. I recommend starting from the beginning -- but realize there are more advanced users that prefer the other option. Renewals will be charged on the 22nd of the month using your credit card on file. If you choose the quarterly or semi-annual option, your renewals will be at the quarterly or semi-annual rate. What level is this class targeted toward? 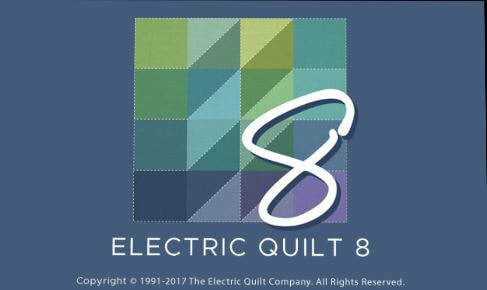 The Electric Quilt 8 Member Studio is designed for all levels of Electric Quilt users who have purchased or upgraded to EQ8. For those that are completely new to Electric Quilt, you may find it useful to complete the Shoot for the Stars with EQ8 series prior to joining. If you are completely new to EQ8, I would be happy to swap out your first class for this Electric Quilt Overview training. Does it matter if I am on a MAC versus PC? No Electric Quilt looks essentially the same for both PC and MAC users. You should be able to successfully complete the blocks and quilts using the instructions in the videos regardless of your type of computer. ​​Will this work with other versions of Electric Quilt? Not really. While you can create most of the projects in EQ7 or EQ Stitch, your software will look different than what is on the video or diagrams included in the tutorials. When will the Classes Start? Lessons will start at the beginning of next month. Lessons will be delivered on Monday, Wednesday and Friday of each week. Will I start from the beginning of the Tech Know Quilter's training? - Although I recommend starting from the beginning, it is your choice. You can start with Working with Fabric Collections (the first class in the training) or, jump into the most current offering (Landscape Quilts), or do something in between. Just send me an email if you would like to start someplace other than the beginning of the series. Can I Take More than One Class at Once? Yes this is an option. We will either send you a code to purchase the other class at a discount from my store, or subtract the second class from your prepaid purchases. Just send me a note when you are ready to do this. Can I Switch Out one (or more) of my Classes? Yes. Just send me a note if you would like to swap your next class for a different one. ​How can I Retrieve my Lessons? The e-mails sent on Monday, Wednesday and Friday will contain links to the videos, a downloadable written tutorial plus any added instructions for completing that day's assignment. The videos are not downloadable -- but you will have unlimited access to them. Can I Access the Material 6 Months from Now? Absolutely. Once the content is delivered to you, you have unlimited access to this material -- even if you leave Tech Know Quilters. Are the videos downloadable? No. However, they may be replayed over and over again. You may download any handouts along with the regular emails. Many students have noted that they love to play the videos on a tablet while working on their desktop or laptop computer. They can pause the video and work on the steps and replay portions when necessary. ​Can I skip a session? No. However, If a particular series does not appeal to you, you do have the option of selecting a class that was previously released. 3 Month Subscription ($90) for a savings of 12% over the monthly rate. 6 Month Subscription ($170) for a savings of 17% over the monthly rate. Future periods will be charged on the 22nd of the month using your credit card on file. Please note that this is a subscription program with an automatic renewal. ​When will I be charged if I enroll in the subscription plan? Subscription payments are processed through my Shopify subscription store. Your first payment will be charged immediately upon checkout. Future payments will be charged using your credit card on file with my Shopify store on the 22th of the month). Can I Change from Monthly to Quarterly or Semi-Annual billing? Yes. Send me an email if you would like to do this and I will walk you through the process. What if I Get Stuck? The Facebook group has a separate post for each lesson where you can post your questions. Often if you have a question, someone else either has had it before or will have it again. So posting your questions allows me to answer these questions to the larger group. 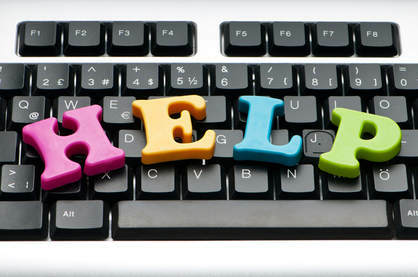 You also have access to two online help sessions a month. This is an opportunity to both dialogue with me and to even screen share your project so we can trouble shoot the question or issue together. Must I be on Facebook to participate in the program? No. The private Facebook group is an option for those that want to interact with other students and ask questions while going through the program. It is also a great opportunity to share pictures of the designs you are creating. What if I get Behind? Can I Drop Out for a Month or Two? There is no option to drop out of the program for one or two months. Once you drop out or cancel, you will need to wait until the next open enrollment period to re-subscribe. Electric Quilt education is a journey, not a race. I encourage you to not become stressed if you aren't getting to all of the lessons. If you do fall behind, consider ignoring some of the lessons that don't interest you at the moment -- or maybe you aren't quite ready to tackle them. You can always come back to these at a later date. Another technique that a number of members have successfully used is binge watching sessions. Since each video is typically around 10 minutes or less -- you can get through a lot of them in a couple of hours. Feel free to continue to ask questions in the Facebook group or the online help sessions -- even if it is six months later. When will I get the bonuses? You bonus will be sent out during April. The following comments were excerpts from posts in the Easy Peasy Easy Draw private Facebook group. Angela D. "Thank you so much Kari for these lessons. I would never have discovered the "hidden" tools in eq7. Great tutorials in an easy to follow format." Betty K. "I can not believe today will be the day of the last block for this class. It has been fun, challenging, and a wonderful learning experience. Thank you Kari for the handouts that explain so well and for the lessons that walk us through the block." Doreen N. "This has been the most awesome class! I have learned so much. Kari you are a wonderful teacher and I look forward to more!!!" Tiny M. "Kari thank you very much for the clear explanation of Easy Peasy Easy Draw. I've learned a lot. I hope you will make another class." Valerie H. "I have enjoyed this class so very much and I feel we have just begun to open the incredible world of creativity that EQ7 offers. I look forward to being able to continue learning from you in this 10 min format. Ty, ty, ty." Isabel A. "Amazing the amount of knowledge gained in these classes. So enjoyable and nice we all finished with stars. And may I say Kari, you are a star." Elizabeth K. "I cannot believe our lessons are over. This has been very enlightening and I've learned so much. Can not wait on the next series to start. Wonderful presentations and classmates. I hope to join you all again." Jean H. "I just finished lesson 12. I just wanted to let you know that I have had EQ since the beginning and I am just now beginning to understand it. So between Catch the Wave and Easy Peasy Easy Draw you have taught me so much more than I have learned from previous classes. Thank you so much." Murna S. "Thank you so much, Kari, for sharing your knowledge with us about the great things that can be accomplished with EQ7. The repetition has really helped me remember the steps of what to do. The time between this class and the next one will give me a chance to catch up. YOU'RE THE BEST!!" Willy T. "I have learned so much ! I don't want to stop my interest in EQ7. I am planning to redo all lessons and then maybe I will be ready for some more. The 10 minutes- a- day is a good routine. I made mistakes when trying to make the blocks, but from those mistakes I learned. I am so much more confident with the different tools. Thanks !" Darlene C. "It was a lot easier than it look Thank you Kari for all the hard work you do PS Please Please think another class when this one is done." Jeanne H. "I'm absolutely loving these lessons but getting behind on everything else! They are addicting!!! :-) Fun, fun, fun!" Isabel A. "Fun, fun and then .... fun again." Marietta B. "Found a new button today: Serendipity. Wow! What a time-saver!" Jeanne H. "I have been lost in the Serendipity!!! What fun and WHY didn't I discover this before???? All these beautiful blocks out of Jacobs Ladder. I had to check out the Kaleidoscope feature and was amazed!" Angela D. "Having a great time playing with electric quilt." Karin P. "Looking at all these lovely blocks and quilts it appears that I am not the only one to 'lose' an hour or two after each lesson.Fantasy quilts are really quite addictive and cost nothing. Thanks Kari!" Are your ready to join the fun? Purchase monthly membership for $34 per month or select from quarterly or semi-annual payment options for increased savings.